Tender tropical plants are exceptionally vulnerable to chilly winds, frosts and freezes, but cold temperatures don't have to be a death knell for sensitive flowers, trees or shrubs. By knowing how to properly revive damaged plants, it is possible to minimize damage and save your favorite tropical plantings. First and foremost, it is best to avoid any cold damage to tropical plants if possible. Use appropriate covers, irrigate the ground thoroughly, apply an insulating layer of mulch, move container plants indoors and take other steps to protect sensitive plants when cold threatens. Anti-transpirant sprays, supplemental heating and cold frames can also prove helpful to protect plants. These measures won't always eliminate all cold damage, but they can minimize how much vulnerable plants may suffer when the temperatures drop. It can be disheartening to see tropical plants lose their vibrancy when they suffer from cold damage, but it is important to be patient before taking drastic revival measures. Depending on the type of damage and the extent of the cold, it may take 1-2 weeks or longer for the full scope of the damage to be visible. While dead bits can be pruned away, it may be advisable to leave damaged parts of the plant in place because they can provide an additional layer of protection to the remainder of the plant if extreme cold strikes again. Once the cold is completely past and no longer a threat, however, damaged leaves, shoots and branches can be pruned. Take care that only truly dead parts are removed – scrape the stem and check for green tissues beneath the outer layer that would indicate the plant is still alive and can recover naturally. If tissues are mushy, slimy or have a foul odor, however, the damage is too severe and those areas should be pruned. When a plant is stressed from cold damage, it is critical not to prune too much tissue away, as over-pruning can further stress the plant. Furthermore, new growth will emerge from healthy areas as the plant recovers, and over-pruning can slow the plant's recovery. In many cases, it is best to wait until the plant has begun actively growing again in order to be certain about which tissues are irrevocably damaged and which can still be productive. When assessing cold damage on a tender plant, gently feel the root ball by moving the plant to see how loose it has become. A firm, solidly entrenched plant should still have a healthy root system that can recover and support new growth, even if a great deal of the plant's stems or foliage has been damaged. If the root ball is very loose and moves easily, however, it has likely suffered severe damage as well and the entire plant may be in jeopardy. After the cold has passed, gentle watering can help rehydrate plants that are drought-stricken from frozen ice, but avoid overwatering that would stimulate new growth and stress an already weakened plant. It is tempting to fertilize a cold-damaged plant to help stimulate new growth and vigorous recovery, but providing excess nutrition can actually be more harmful than helpful. Fertilizer will indeed stimulate new growth, but that puts the plant's energy into more growth than it can handle after being damaged. Instead, continue to keep the plant hydrated but avoid unnecessary fertilization. It is also very tempting to move container plants indoors or provide strong supplemental heat to warm them up after a cold shock, but doing so can actually shock plants even further. If the cold period is lengthy or even colder temperatures are predicted, it is helpful to move plants to more moderate shelter, but allow them to adjust to their new surroundings very gradually to minimize any quick changes that can irritate already stressed plants. Even the most tender, delicate plants are hardier than we realize, and they are often able to recover from cold snaps we would assume to be deadly. 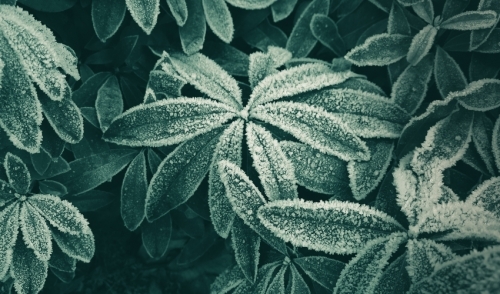 By recognizing cold damage and knowing how to revive plants without causing further stress, it is possible to protect and nurture every tropical plant in your garden and landscape, even when the weather isn't quite the tropical climate they may prefer.